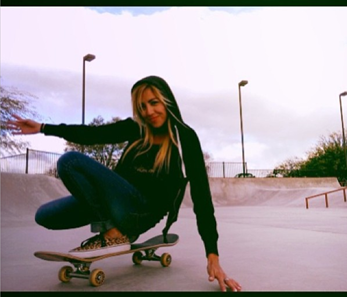 Lorena Brown did not skateboard as a child she just decided as an adult to give it a try. I’m so glad she did and now she’s motivating others to start and keep skating. Thanks Lorena – I’m glad you’re an inspiration & not a quitter – plus I love your style including those super cute sneakers! Why wear a skirt skateboarding? 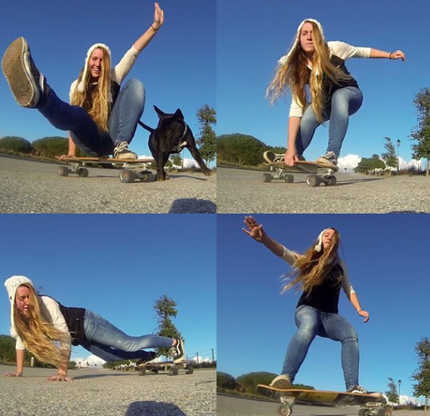 I don’t skateboard because I’m trying to be a boy – I’m a girl and I’m a proud girl. Skirts are fun and fashionable so why not wear one that is skate friendly. Here are my personal thoughts on what makes a skirt skate friendly. If you’re planning on just cruising any skirt that allows you to push and doesn’t get stuck in wheels will work. If you’re more adventurous – I advise above the knee to allow for pushing. I favor skater style over pencil style because a skater skirt will flow up & twirl not creep up & have to be pulled down. At least when I’m skating, I don’t want to be adjusting my skirt. As for material, I’m aware latex is currently a fashion trend and that leather is always fashionable but for skating I prefer a lighter more breathable material like cotton. I’m pro shorts or leggings under the skirt. Why wear a skirt if you’re already wearing shorts or leggings – style the skirt is a fashion statement. I’m not the only skirt loving fashionista click to read Teen Vogues Top 100 cute skirts for fall! On or off the board wear what you want and stand proud. Video on the skatingfashionista instagram. I am a fan of yoga and skateboarding. I think of skateboarding as rolling yoga. And yoga wear is fashionable. Yes, there are things to look out for like “see through” yoga pants and a crop top alone is probably inappropriate for school and any shorts can be too short, but overall yoga clothes are fashionable and comfortable. I wear my yoga clothes skateboarding. Not only do they move with me without ripping they wick the sweat away. I do not know how material knows you are sweating. I just feel dry and look dry which is always fashionable. As for cost – shop around – most expensive is not always most stylish. Yoga clothes can be mixed up with cute jeans or a cute top. It’s about feeling comfortable in your clothes & having fun. In this picture I’m wearing Onzie capris – pronounced Own-Zee – I love them for their style & I appreciate they are 100% made in the U.S. and ship worldwide. And yes it does get cold in San Diego so I have a sweatshirt on. Skateboarding should free you physically, mentally and spiritually – make sure your clothes can do that too! There is nothing average about Tisha. 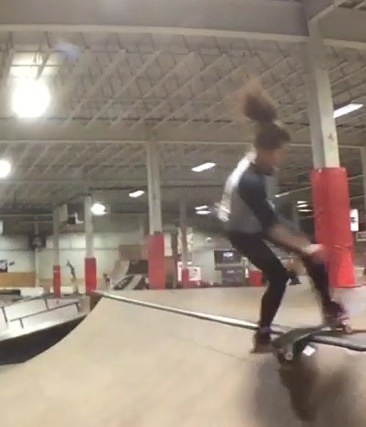 The picture doesn’t do her justice – you have to go see the video of her owning the half pipe to see how much skill and fun she has on the edge. She’s a stylish shredder originally from Guam now chillin on the East Coast. That’s just one of the awesome things about skateboarding – any person, any day, any country – have board can skate. 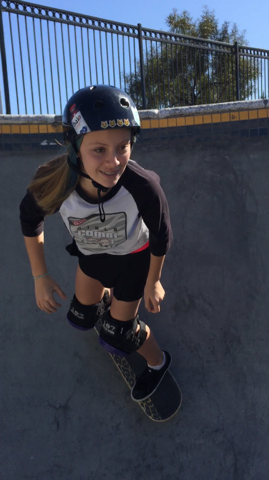 And I would love to skate where Tisha is – this West Coast girl wants to visit the East Coast. Today March 8th is International Women’s Day for more information check out their site and below I’m sharing some important quotes. “The unfortunate fact is that women are still not paid equally to that of their male counterparts, women still are not present in equal numbers in business or politics, and globally women’s education, health and the violence against them is worse than that of men. I live in San Diego County so I’m within driving distance of several public skate parks and that’s where I usually skate. I’m not saying don’t skate on your street or at private facilities, I’m saying it’s nice to have a public park. 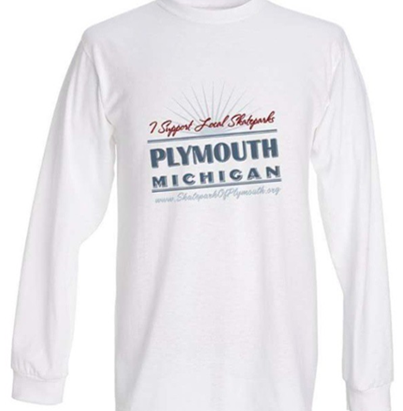 I would like anyone who’s reading this to check out Skate Plymouth Michigan. All I know about Michigan is it’s a mitten in the mid-west. However, thanks to skateboarding I have friends in Plymouth Michigan. One of those friends is leading the charge to build this park and his key inspiration is his 5 year old shredder daughter. I believe all skate parks should be co-ed and have challenges for all skill levels. The world is a better place when there is no discrimination on or off the board. And no snaking – snaking is never fashionable at any park even if it’s packed or you’re getting ready for a competition. No snaking ever – keep it fashionable. And let’s get this public Plymouth Michigan park built! Paulina is definitely a stylish shredder. She skates alone and with her friends including her animal friends – that’s right she sometimes rides while carrying her puppy friend. 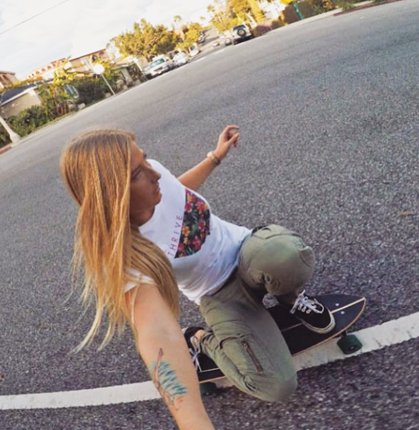 Paulina says she doesn’t know what inspired her to go out and buy a skateboard – she’s just glad she did. I’m glad too and I hope other girls will see her and get inspired to get their own board. And don’t worry about how well you’ll skate the first time – skateboarding improves with time. Believe me you don’t have to be a super shredder to have fun skateboarding. Till next time keep it fashionable and always share your skateboarding pictures – more girls do skate as they see girls skateboarding. Rita’s caption for this “girls just want to have fun”! You know I couldn’t agree more. Skateboarding should be fun, which is not to say you can’t get hurt. Skateboarding is a sport and in sports you can get hurt. I think you shouldn’t let the fear of getting hurt stop you from skateboarding. I also think it’s up to the skateboarder to decide what safety gear to wear. But if you’re having a bad hair day, it’s better to wear the helmet. Bad hair is never in fashion! And if people make fun of you for wearing pads – that’s them not you. People with real style do not laugh at the expense of others. So till next time, keep it fashionable & fun like Rita, who’s ripped jeans I am loving! 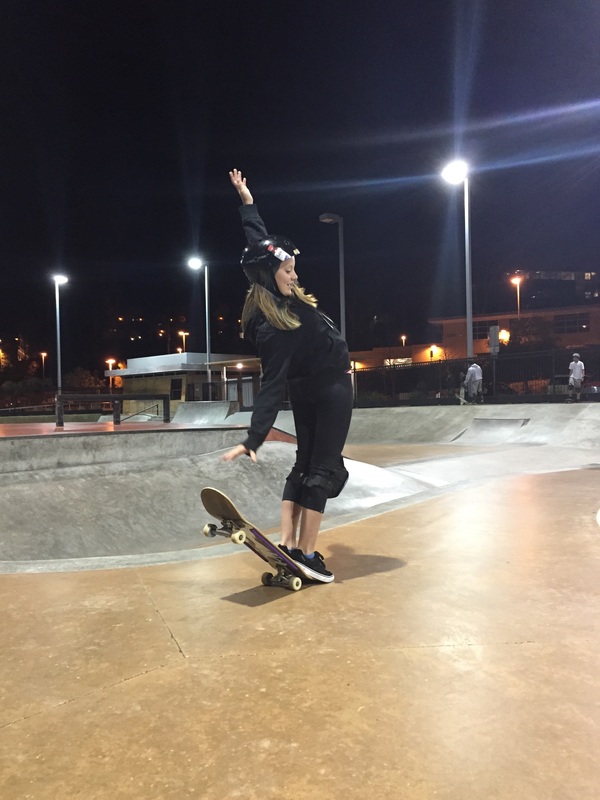 Blondewantspineapple and skateboarding – she loves skating in Cadiz and Chiclana South Spain! You can just tell she’s having fun and she definitely has style. 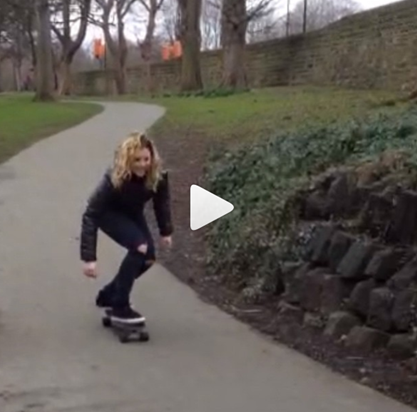 I’m loving that puppy too – he knows to keep his eye on the skatingfashionista & stay by her board! One of the best things about skateboarding is it is universal – doesn’t matter what language you speak or where you skate – you can always connect with a fellow skater. And smiling is universally fashionable – I don’t believe it causes wrinkles. Why Does This Skatingfashionista Drink Boxed Water? I was first attracted to Boxed Water when I saw a display at the Anaheim Train Station. I thought that’s cool and it’s on sale – so I tried it. I liked it – it tasted like water and the box was rad. Before I saw water in plastic bottles so I thought that’s how it is – water comes in plastic bottles. Then I saw Boxed Water and saw an option. To me it’s just like skateboarding. Most people think skateboarding is for boys because that’s what they see. If I want more girls to skateboard, I have to show girls skateboarding and if I want more people to drink Boxed Water, I have to show at least myself drinking it. I don’t hate plastic bottles – it’s just they’re not as recyclable and they’re bulkier when empty. 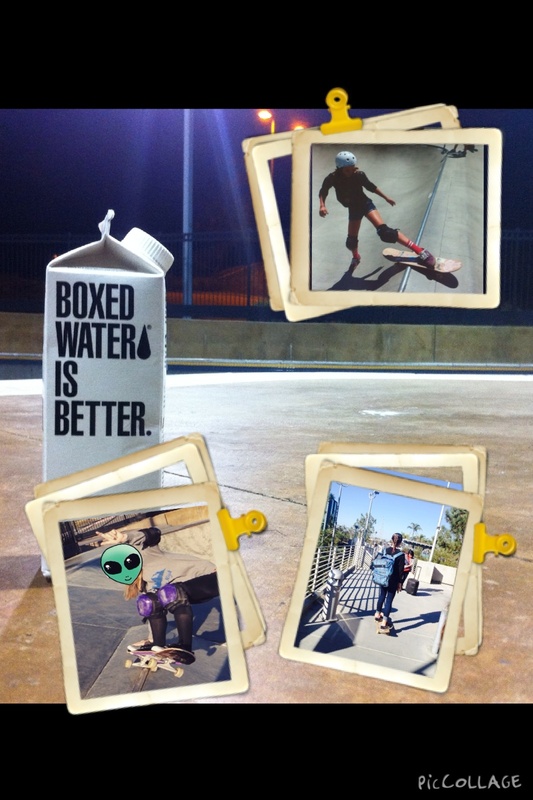 For the stats go to Boxed Water Site and I don’t know if heated plastic (like leaving a water bottle in your car) releases toxins that could kill me – I’m an amateur skateboarder and fashionista – I care more that the Boxed Water looks fashionable. When you visit Boxed Water you’ll also see they donate 1% of annual revenue to world water relief, reforestation, and environmental protection projects – I like that. I know I’m blessed to live where I live, skate when I want, and never worry about where my water comes from the least I can do is help others.